In this podcast series, Lighthouse Creative Producer Andrew Sleigh heads to Shenzhen to meet the makers working in China’s world-leading centre of electronics manufacturing. Thirty years ago, Shenzhen was little more than a fishing village with around 30,000 inhabitants. Today it is a modern metropolis with a population approaching 15 million. This phenomenal growth has been driven by the area’s development as a manufacturing ecosystem. A place where innovators can get a product designed, prototyped, mass-produced and distributed without leaving the city. A place where a huge multinational electronics manufacturing company can build a complex the size of a small town, complete with factories, dormitories, banks, restaurants, hospitals, and even TV stations, to attract a talented workforce and win business from the world’s tech giants. Products manufactured in Shenzhen are distributed worldwide. The chances are that you have many in your home. Foxconn alone, one of the biggest multinationals, has a client list including Blackberry, Kindle, Nokia, Apple, PlayStation and many more. More recently, Shenzhen has become a magnet for international entrepreneurs, drawn by the fact that, in Shenzhen, they can bring their products to market faster, cheaper, and more successfully than anywhere else in the world. In this series, Andrew speaks to some of Shenzhen’s grassroots makers, maker-entrepreneurs, designers, and manufacturers about their products and passions, and to find out what it’s like to be part of China’s thriving electronics community. Hello Shenzhen is a bilateral residency exchange programme connecting makers in the UK and China, funded by the British Council. Andrew visited the city in November 2017. This podcast series includes seven episodes. Check back for future episodes or follow us on Twitter @LighthouseArts or on Facebook for updates. All the episodes can also be listened to on Apple Podcasts. 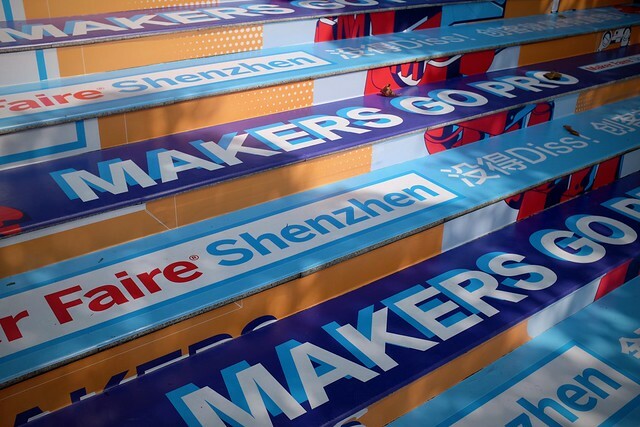 Andrew heads to Shenzhen Maker Faire, which hosts 200+ makers, forums and workshops, and attracts an international audience of thousands. Here, he speaks to some of this year’s participants including a local hobbyist making Wolverine-esque prosthetics; the business product manager at a successful open-source hardware development company; and a 12-year-old South Korean student hoping to make the robots of the future. Andrew talks to Christina about her passion for creating educational robot kits, challenging sexism, the difference between British and Chinese entrepreneurialism, and surviving in Shenzhen’s fiercely competitive technology market. Andrew and Vicky talk about open source, copycat products, industry work-life balance, embracing the free market, and Shanzhai, an approach to technology development which, after a complicated past, is now credited with fuelling Shenzhen’s rapid innovation culture. Music by Blank & Kytt. Situated in the heart of Shenzhen, x.factory, operated by Chaihuo Makerspace, is a new maker hub providing a prototyping workshop, co-working space and consulting services. Violet and Andrew discuss gender issues in maker culture, the unique appeal of Shenzhen and how Chaihuo became China’s poster child for makerspaces after a visit from Premier Li Keqiang. So, how do products get designed and made in Shenzhen? While some of the bigger manufacturers have all the design or engineering expertise they need in-house, many need to bring in skills from outside. Andrew talks to product design companies Innozen Design and Artop Group to find out how they help their clients navigate Shenzhen’s vast network of suppliers and manufacturers. Plus, why Shenzhen makers focus on business models, the industry’s move towards sustainability, and the growing national demand for Chinese brands. Carrie Leung – a teacher at the Shenzhen American International School where – with a 100% product-based learning curriculum – students, as young as three, learn by building end products from a robot to the sofa they’re going to sit on in class. James Simpson – the founder of SteamHead, a community space where teachers learn from each other, and gain the skills to provide maker-based education. Lit Lao – the founder of Litchee Lab, where they design maker education content for schools, to help children develop creative skills to use in their adult professions, whether that’s as a lawyer, an accountant or a maker. In this final episode, Andrew visits Lab 0, a makerspace run by and for its members, without government subsidy or commercial income. He speaks with one of the founders, Janek Mann about the strange contradictions that run through Shenzhen and its maker culture. Hello Shenzhen is developed in partnership with Liz Corbin, Institute of Making, UCL and supported by the Arts and Humanities Research Council.